What do we do when an important part of an exhibit suddenly goes missing on the way to the trade fair? The response of the Berlin-based company Blackcam, a manufacturer of camera motion systems, is to turn to the igus 3D printing service. Using industrial 3D printers, the motion plastics specialist manufactures unique customer wear-resistant parts within a few hours. This is how the missing special plain bearing was made. A look behind the scenes of any Hollywood film set will almost always reveal a track on which the large camera dolly moves. But what has worked well for decades for filming movies is not suitable for live broadcasts, as these camera dolly systems can restrict the view at concerts and sports events. Blackcam, a Berlin-based company, is therefore developing a new solution: compact, remote-controlled dolly systems that move the camera over narrow tracks. These types of dolly systems are becoming increasingly popular in the entertainment industry. Ferenc Tiefenbach, an engineer at Blackcam, is often on the road with exhibits at trade fairs. While travelling through Düsseldorf Airport, the engineer was carrying the prototype of a new dolly system developed for football matches when he noticed one of the plain bearing was defective. There was no spare part. So what to do? Tiefenbach turned to the igus 3D printing service. The motion plastics specialist produces small series and one-offs from high-performance plastics quickly using industrial 3D printers. 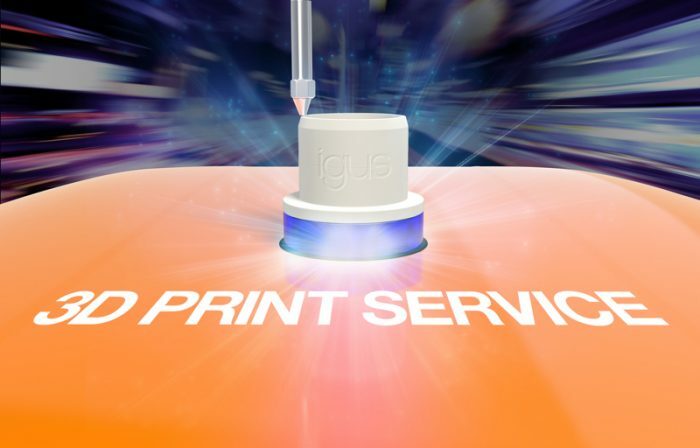 Upload the CAD model of the part to the igus website, select printing material, for example iglidur I180, a wear-resistant, high-performance plastic, and order it immediately. The part is shipped usually within 24 hours. ‘In my urgent case, I was able to pick up the bearing a few hours after placing the order,” Ferenc Tiefenbach enthuses about the service, which is not a given in the industry. Thus the exhibit was again ready for the trade fair. “It is remarkable that, despite the size of the company, igus can produce a single component so quickly. The costs are also reasonable, in this case only €96.” From its range of additive manufacturing materials, iglidur I180 is chosen for this 3D printing job. The high-performance plastic is impressive with its superior wear resistance. The igus test laboratory has proven its lead over the classic filament made of acrylonitrile-butadiene-styrene (ABS) in an experiment. Plain bearings moved on a 0.37-metre-long, hard anodised aluminium shaft at a speed of 0.34 metres per second and a surface pressure of 0.11 MPa. The result: The 3D-printed bearing made of ABS showed a wear rate of 13.3 micrometres per kilometre. For the bearing made of iglidur I180 over the same distance, the wear was only 0.8 micrometres. However, the bearings are not only more durable, they are also more economical in operation. They enable maintenance-free dry operation without the need for lubrication. Thus, they are the ideal candidates for the camera dolly systems from Blackcam. For more information, please visit http://www.igus.eu.